Next time you’re yearning for a sweet treat, try one of these. Volumes could be filled about our love for chocolate chip cookies (particularly when sea salt is involved). 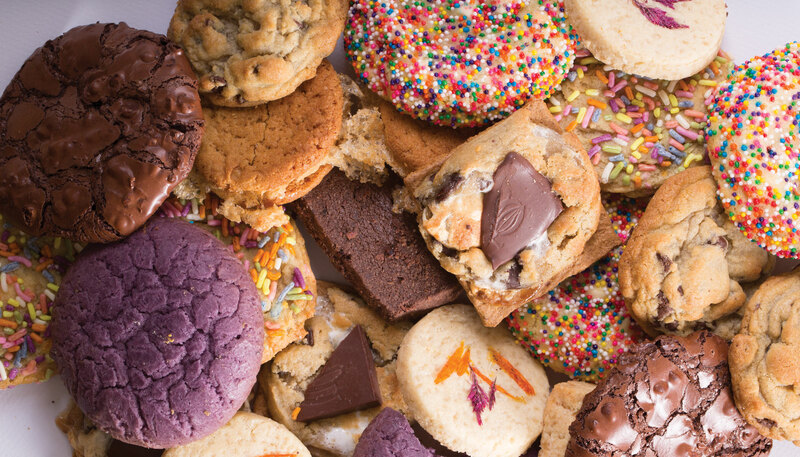 Yet there are many other, offbeat cookies being turned out by our local, talented bakers that we can’t get enough of. And while you may think anyone (including you) can bake a cookie, these special treats are best left to the pros. Your job? Give them a try. Robin Wehl Martin has a whole shop dedicated to cookies, so it makes sense that hers are some of the best in town. Her friend, ice cream maven Molly Moon Neitzel, convinced Martin to open the adorable space—mostly bright and white, with accents of robin’s egg blue, of course. Her cookies (chewy and small compared to those from some other bakeries) are best when they’re served hugging a scoop of Molly Moon’s ice cream. Our pick: We love a good pun almost as much as we love a good cookie, and the Mackles’more ($2)—an ode to Seattle’s homegrown hip-hopper—is as good as it gets, in the form of a graham cracker topped with a marshmallow-studded chocolate chip cookie and a Theo chocolate chunk. People may assume that because they’re beautiful—an unparalleled shade of purple—Chera Amlag’s ube desserts are popular based on looks alone. But anyone who has tried the Filipino-style treats from her petite, utilitarian production kitchen in Ballard, with its small counter of ready-to-go sweets, can verify that her goods are as delicious as they are pretty. Our pick: There’s only one cookie on the menu, but it’s all you need: The ube cookie ($2) is chewy and buttery, with a distinctive flavor a little like vanilla birthday cake. This cookie is similar to a really great sugar cookie—only purple. Bright and ethereal, this Pioneer Square café just feels good; it doesn’t hurt that it makes some of the best pastries in town (as well as composed plates of seasonal salads and fork-worthy toasts). The menu changes regularly, so try not to be disappointed—as I continue to be—when you discover your favorite peanut-butter-and-jelly thumbprint isn’t available every day. Bonus: The London Plane also supplies the pastries for La Marzocco’s flagship café at KEXP at Seattle Center, so try a bite there as well. Our pick: Whatever delicate shortbread is available when you visit—be it cacao nib pecan, espresso, Earl Grey, honey ginger or some such ($1.50)—is the ideal teatime treat. We promised not to talk about chocolate chip cookies, but if we did, we’d be singing the praises of the salted chocolate chip cookie ($2) from this primarily takeout shop run by Lark chef John Sundstrom, whose fine dining destination is just next door. While this spot specializes more in the savory than the sweet, it does both well. Our pick: Opt for the made-to-order peanut butter sandwich cookies ($3.50 for two), which have peanut butter cream oozing out from the center and are rolled in light, crispy chicharróns (pork rinds) for the ultimate in salty sweetness. Named for owner Emily Allport’s two dachsunds, this pop-up-and-wholesale-only cookie business gets creative with flavors, such as the unexpectedly delicious lemon ginger; it also mixes in lots of chunks and other ingredients. Allport bakes out of Full Tilt Ice Cream’s White Center location, and most of the time you can find her cookies at all Full Tilt shops (to make into massive ice cream sandwiches). Our pick: It’s impossible to turn down the Birthday Cake ($2): a soft almond-extract-flavored cookie reminiscent of yellow boxed cake, loaded with white chocolate chips and covered in sprinkles (the little round ones called nonpareils, which offer the best crunch).